After a lot of planning and rescheduling, we're finally happy to present the pilot episode of the Twin Cities Naturalist Podcast. Thank you to those of you who have been reading the blog that accompanies the podcast. The blog will be updated far more often than the podcast. Our goal is to to have the podcast come out once a month. We've been doing some work on the technology end and the online podcast player should be working smoothly now. If you would prefer to listen to the podcast in iTunes you can subscribe in the reader on the right hand column. You can also sign up there to get emails with our blog posts and podcasts. Please, leave a message in the comments and tell us what you think of the show. This month we discuss phenology, and then interview our special guest, Liz Harper. She shares her thoughts on listing and the crazyness of living her neighborhood after reporting a "rare" bird species. Click the little triangle on the player to listen. Thanks for stopping in. Here are some photos we discussed on the podcast. 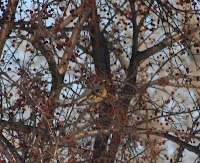 First up is a somewhat blurry photo of the Varied Thrush in Roseville. This second photo was taken by our guest Liz Harper and shows the pretty typical street scene of birders looking for the thrush. Click for larger views. There is a scarlet ibis living on my porch. You should come visit me.